I'm lucky to have an attached garage with enough space for printmaking! The previous owner had built in some counters, which work more or less for me now - although a totally custom shop would be super cool someday. Below you can see some videos and pictures that show, in short form, how I work with linocut. Check out my cutting tools, my great printing press, and the way the inks spread out on my Plexiglas-covered board. I am a big fan of how on a good day, all the separate ingredients and processes add up to a series of clean, vibrant and original prints. A busy corner of my work space. You can see my inks, prints I've kept for myself, storage shelves, cutting mat & tools, and the edge of my inking board. Here is the start of a Christmas card image - a sled that says "Noel" on the side with a gift sack. I was trying to come up with a holiday card idea that wasn't super kitschy since that's not really my style! Keep scrolling for some more process pics. Cutting along lines I've drawn in pencil. I'm using my trusty old etching tools here, but I also love my Pfeil set. I'm getting there! I eventually cut the gift sack out, so I can ink the pieces in different colours and put them together to print. Notice the Noel is spelled backwards, so it will print the right way! The etched lino images are called plates, and each one needs to be inked to produce a print! I use paint scrapers to combine water based ink with retarder or extender products, if needed, to keep it supple longer. I mix oil based ink with tack reducer or extra oil to thin it out. The little rollers, or "brayers," come in various sizes - I love having a variety so I can use a lot of ink here, and a little there. 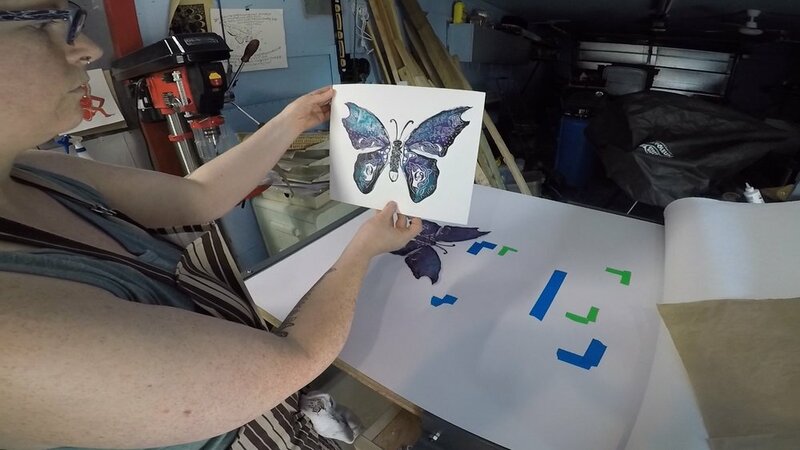 You can see various layers of purple, blue and silver on this butterfly. It's nice to try something a little different each time. This is my printing press! I got it from Thomas Presses at http://thomaspresses.ca/index.html. Mine has a 30" x 48" print bed so I can do several things at once, or a very large print, quite comfortably. Below, see how the paper gets laid down and covered with newsprint, and then I crank the roller to move the press bed. I pull up the paper to reveal a finished print! I have shelf by the window that is a good size to hold long boards, on which I dry the finished prints. It works pretty well for me, since it's out of the inking and pressing zones! I really like having a full shelf of drying prints at the end of the day.